If you have any questions or points of view regarding my homepage or Chow Chow, please feel free to contact me by e-mail or use the form below. I'll get back to you as soon as possible. I look forward to hear from you. 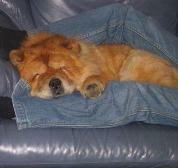 If you want to send pictures of Chow Chows to me please use the email adress.